Oregon and Salmon Fishing go together and the Rogue River is home to hundreds of thousands of mighty Fall King Salmon. Fall King Salmon fishing in Southern Oregon is a Northwest tradition going back 150 years for settlers and a thousand years for Native Americans. 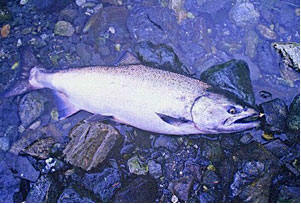 With large returns of Oregon Fall Salmon fishing is great in all our Southern Oregon rivers. Nowhere in an area of 180 miles of coastline are so many Fall King Salmon found as in Southern Oregon which is the reason opportunities for salmon fishing here are so great. Fall King Salmon fishing is readily available here. 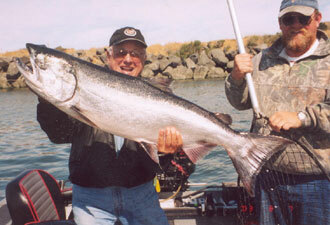 Good Southern Oregon Salmon Fishing can be expected 9 months a year. Southern Oregon salmon fishing river’s have annual returns, not counting ocean harvest (of 20% plus) of over 650,000 returning Fall King Salmon. Making Southern Oregon fall salmon fishing opportunities a fisherman’s vacation paradise. September 1st kicks off Coquille River salmon fishing season at Bandon Oregon. The Coquille River will fill with 30,000 Fall King Salmon averaging 25 to 50 pounds. All of these returning fall salmon are caught in tidewater areas of the Lower Coquille River near Bandon. These King Salmon are big and mean with very good quality. Coquille River King Salmon fishing remains good September through October. By late September a large run of Silver Salmon or Coho Salmon will join the Kings on the Coquille. Crabbing is also very good at this time of year. 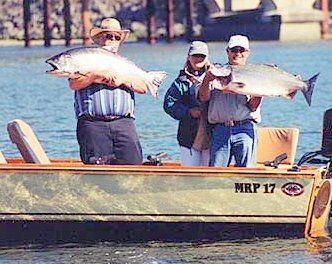 October 1st will begin the Chetco River Fall King Salmon fishing season returning 20,000 Fall King Salmon averaging 25 to 50 pounds. Hundreds of Fall King Salmon will stack up awaiting autumn rains to raise this rivers flow to allow upstream passage. The Chetco River which is only 50 miles long raises and drops quickly. Trolling for King Salmon is also good in the Chetco River estuary in October. King Salmon fishing remains good from October to January. The Elk River is 50 miles long with 10 miles of the best King Salmon fishing water for late season Fall King Salmon to be found anywhere. The Elk River is a wonderful river for Oregon salmon fishing, a small stream with more King salmon holding water and holes per mile than any other stream in Oregon. The Elk River King Salmon will out fight all other King Salmon hands down. More fish are lost here on the Elk River than are landed due to water conditions and the attitude of these Elk River King Salmon. On the average these big Fall King Salmon will win their battle 50% of the time as they are big, mean and aggressive, all qualities we want in great Oregon Salmon fishing trips. The Sixes River is a sister stream to the Elk River, these two streams enter the Pacific Ocean at Cape Blanco State Park about 2 miles apart. The Sixes is about 50 miles long and has a gentler gradient than the Elk River. The Umpqua River runs between Winchester Bay and Reedsport on the Southern Oregon Coast upstream through Scottsburg and Elkton and on to Roseburg at Inter State 5. The is an area between I-5 and the South Umpqua River confluence with the North Umpqua River is a great area for Umpqua River King Salmon fishing.